This afternoon, around 1:40 P.M. a man entered the Jelly Belly store at the Folsom Premium Outlets, and pointed a pepper spray canister at the clerk. The man told the clerk if she didn’t want to be sprayed; she should give him the money from the register. The clerk complied and the man casually strolled out of the store with an undisclosed amount of cash. The suspect is described as a white male, 6 feet tall, around 270 pounds with a “large belly”, in his late 40s’ to early 50s’, with wavy/curly balding dark hair. He was wearing a brown collared shirt and brown pants. 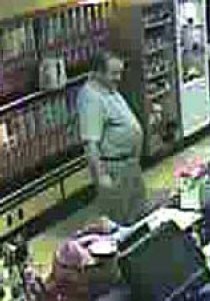 Luckily, police have a photo of the man – and his jelly belly. Folsom Police Department investigators are seeking the public’s help in identifying the man. If you have any information regarding this robbery, please contact Detective Andrew Bates at (916) 355-7230.